The students in room 36 at Loveland Middle School (LMS) learn a variety of life skills - everything from cooking and washing dishes, to doing laundry and sewing. They have made iPad covers for their parents, mittens for a fellow student, and creative hand puppets to play with. One of their latest projects has a special purpose – to cover the windows of 30 seventh-grade classrooms should that ever be needed in an emergency situation. After counting and measuring windows, Ms. Bruening ordered tension rods and enough fabric to make curtains for all classrooms in the seventh-grade pod. Although they are decorative – and perfectly fitting the environment with tiger stripes and paw prints – these shades are meant to be used as one of the final lines of defense between a room of children and a potentially ill-intentioned intruder. What used to be generally agreed-upon practices, such as locking doors and checking in visitors at the front desk, now have become official procedures at Loveland and many other schools across the country. School security is at the forefront of the educational conversation, but the reality of the need to keep students safe from those who intend to cause harm often leaves parents and teachers feeling dismayed and helpless. Photo caption (top): Ms. Bruening assists LMS student Sam Kruse sew one of the 30 safety curtains for the seventh-grade classroom windows. 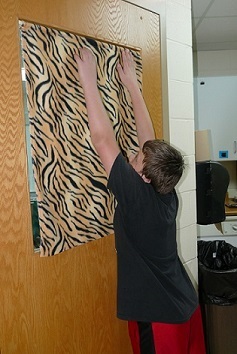 Photo caption (bottom): LMS student Kyle Herlinger uses a tension rod to attach the finished curtain to the classroom window.